When Heather Shiels first realized her 15-week-old kitten Spock was missing last week, she thought he had somehow gotten stuck in the dishwasher. Somehow, tiny Spock had opened up the kitchen cabinet, climbed inside — and stuck his head through a very, very small hole, which he was unable to pull himself out of again. Shiels and her husband tried to pull Spock out of the hole themselves, but he was too stuck, and they were afraid of hurting him. They even tried taking the bottom of the cabinet out to gain better access, but nothing was working. They finally decided to contact the RSPCA in hopes that it could send someone to help free their adventurous little kitten. 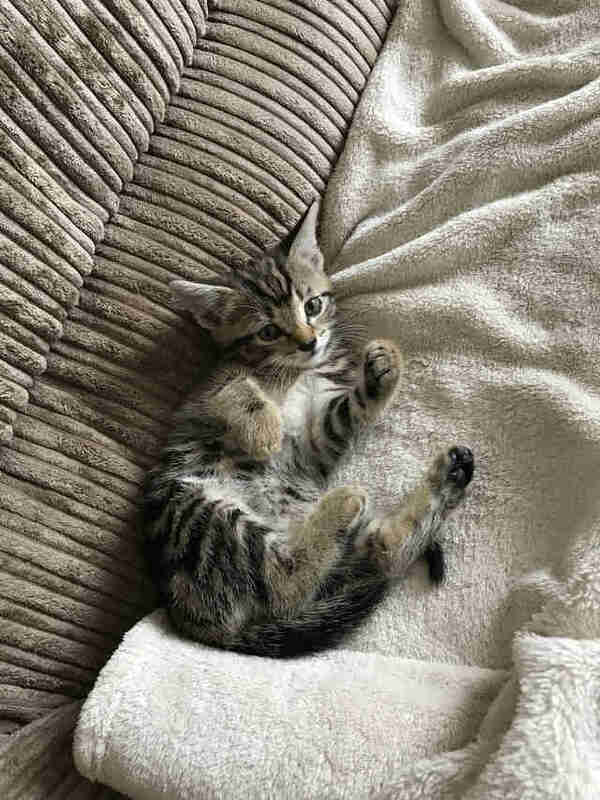 Angela Paxton-Taylor, an inspector with the RSPCA, responded to the call, and tried putting cooking oil and margarine around the kitten’s neck in order to make it easier to pull him out. It unfortunately didn’t work, and Spock’s rescuers could hear him meowing for help and getting more stressed by the minute. 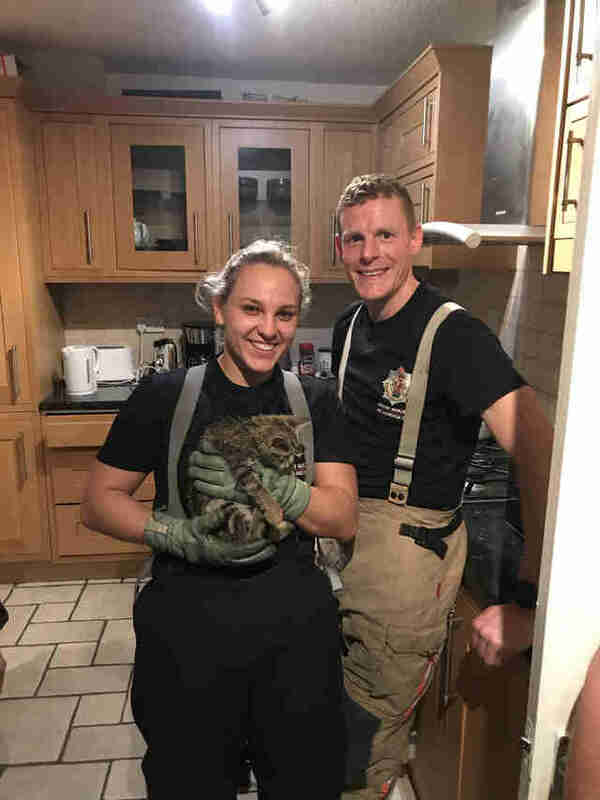 Paxton-Taylor realized she wasn’t going to be able to free Spock on her own, and decided to contact Greater Manchester Fire and Rescue Services for assistance. 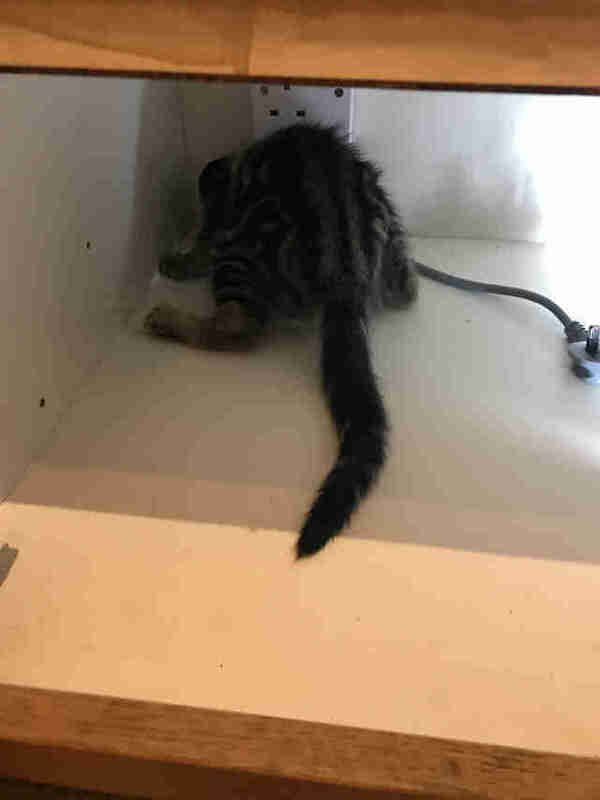 The firefighters first shut off the power to a live wire that was behind the back of the cabinet, and then used an electric saw to very carefully cut through the cabinet in order to finally free the tiny kitten. Poor Spock was shaken up from his ordeal, but his family quickly offered him tons of love and comfort to help him relax. 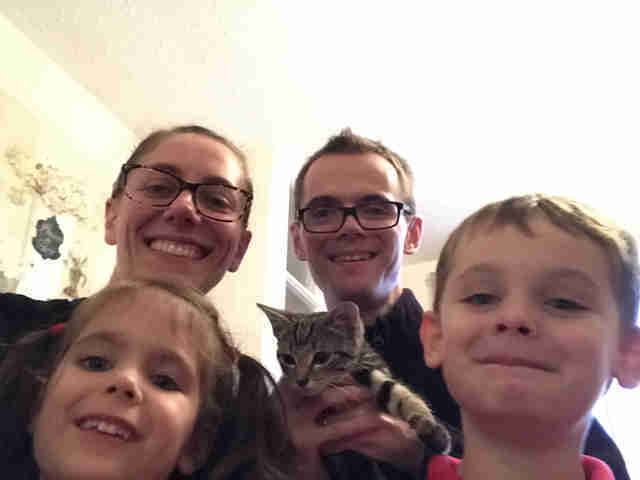 Spock’s family rushed him to the vet after he was freed to make sure he hadn’t sustained any injuries, but thankfully, he appeared to be mostly OK. He had a bit of a sore neck and the vet prescribed him some pain medication, but now, a week later, Spock is back to his normal, playful self.